The earliest evidence of a Jutish presence in Hampshire dates back to the sixth decade of the fifth century. At this stage Jutes had already settled in the area. Perhaps they might have been descendants of the foederati (employed as mercenaries by the Roman state) who, for whatever reason, had made their homes here. It also seems a possibility that this early Jutish element might have been kin to the keel-loads of warriors who landed with Hengist at the request of Vortigern in 449. The decade 460-470 for the first Jutes in Hampshire would be compatible with Romano-British policy at this time, a policy which proved to be fatally flawed. During the 450s events moved at a considerable pace. Indeed, the increasing numbers of Germanic settlers arriving in Britain as a result of such ill-considered action caused a civil war between Vortigern and his son, Vortiger, because the young prince was at total odds with his father's policy. This feud took place in spite of all the attacks inflicted on the Britons by the Picts and Scotti. Considering the prevailing conditions, Jutes might also have arrived as pirates, or as raiders, some of whom might have established permanent communities, even intermarrying with the local Britons. There would have been plenty of opportunity when the Romano-British state was engaged in internal strife. However, these very early settlers were still living on Romano-British soil. The territory was taken later, by right of conquest, after the collapse of the Romano-British regime established by the leadership of Ambrosius Aurelius (Welsh, Emrys Eurben), during a period of British reversals. Undoubtedly, the Germanic population, together with mixed race people and pro-German Britons played a large part in weakening British resistance, the question now is how did the later province of the Meonware come about. To understand who these people were, maybe it is necessary to accept that there might have been a longstanding affinity between Jute and Saxon. 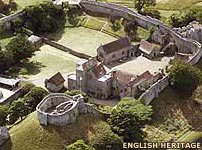 Such a relationship could have been strengthened in adversity, when Ælle and Aesc were decisively defeated by the Romano-British at Mount Badon. The tide had turned against the settlers, and if the bretwalda, Ælle, had had in mind a campaign to advance westwards after his victorious year in 491, then the triumph of the Romano-Britons at Badon would have brought a halt to those ambitions. Some archaeologists have told us that there is evidence in English pottery of the early sixth century, found in Germany, to suggest a backwash of settlers returning from Britain. This could have been because of a continuing Romano-British resurgence down the upper and middle Thames Valley during the two decades after Mount Badon. In other words the descendants of the foederati, the new settlers and any pro-German or mixed race people were now in disarray. A group called the Gewisse (compare Old English 'gewis' meaning certain and the cognate Welsh 'gwyddys' meaning 'is known', in other words, those who are informed), reputed by Bede to have come from this region, might have been pushed eastwards during these years, losing the territory they had occupied. This crisis could have precipitated a deepening of brotherhood between Saxon and Jutish tribesmen, between the Gewisse and the Cantware in whose kingdom the latter had potentially resettled, thus strengthening bonds already forged under the leadership of the Bretwalda. A timetable of events based on the idea that the Jutes, Saxons and kindred descendants of the foederati, were stalwart brothers in arms, is given below. Since they are sometimes considered to have been Frisians, perhaps the fifth and sixth century Jutes who settled in Hampshire and the Isle of Wight came from southern Jutland, rather than the northern part of the peninsular. King Canute based on a mediaeval illustration. One of England's Danish kings, reigning 1016-1035. He was the son of Sweyn Forkbeard and Gunhild of Poland. 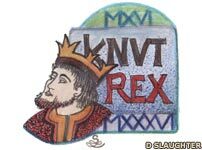 By 1028 he was king of Denmark, England, Norway, and was known as Canute the Wealthy. Today, there are two forms of Danish spoken in Jutland. They are referred to as North and South Jutlandish, and both belong to the North Germanic branch. The latter is spoken in the districts around the Danish-German frontier. However, South Jutlandish is distinct from North Jutlandish because it contains elements of Low German, which is a descendant of Old Saxon, and is a member of the South Germanic branch. The fifth and sixth century Jutes of Hampshire probably spoke an ancestral form of South Jutlandish, if they sailed from the coast just North of Flenberg. Therefore, if they said their sentences slowly they would have been understood by Old English speakers. The same conditions apply for Breton and Cornish speakers today. This circumstance of mutually understood languages is accepted by specialists of the period and, on this assumption, a language timeline has been attempted and is shown below. For the exercise in question, our timeline has been based on one generation for every thirty years and a notional longevity of sixty years. People of this era would not have reached sixty, except for the higher echelons of society, a few or whom might have survived beyond seventy. For instance, the first wave of Jutes might be said to have belonged to the generation of 430-490, and that of their children and the second wave of Jutes to the generation of 460-520. Thus we have a recurring overlap of a notional thirty years. Therefore the dates for the period timeline below are both conjecture and approximation. Consideration has also been given to the impact of changing circumstances in a warrior society, like the decline of West Saxon influence after the reign of King Ine, which might have accelerated changes in language habit. The speech of the Jutes is referred to as Old Jutlandish, a term coined here for convenience. 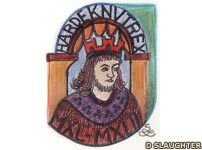 King Hardicanute based on a mediaeval illustration. The last of England's Danish kings, reigning 1040-1042. He was the only son of Canute and Emma of Normandy. King of Denmark 1035-1042, he died of a fit while drinking at a wedding feast.